French President Emmanuel Macron has warned that the European Union would not "be held hostage" to the Brexit crisis and said that a lengthy extension of the deadline for Britain to leave the bloc was "not a certainty". 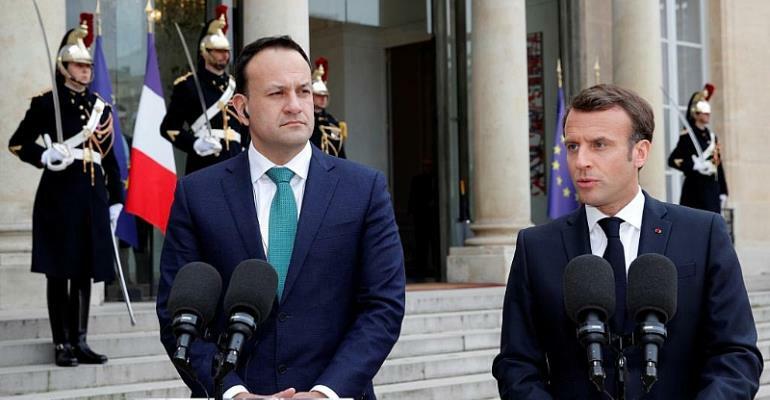 Speaking during a visit to Paris by Irish Prime Minister Leo Varadkar, the French leader said: "Our priority must be the proper functioning of the European Union and the single market. "The EU cannot be held hostage on a long-term basis to the resolution of a political crisis in the United Kingdom," he said. He added that France was "open" to a lengthy extension of the Brexit deadline on certain conditions but that it was "neither a certainty nor automatic. I am repeating it here very strongly." The comments underline growing frustration in Paris about the Brexit process, which has diverted attention away from pro-European Macron's plans for reinforcing the bloc. Following the rejection of British Prime Minister Theresa May's proposed Brexit deal three times, and inconclusive votes on alternative ideas in the House of Commons, Macron said the country was on course to crash out of the EU. "If the United Kingdom is unable three years after the referendum to propose a solution that commands a majority, it will have chosen de facto for itself to leave without a deal and we are unable to prevent this failure," he said. Repeating what was expressed by European leaders at a meeting in Brussels on March 22, Macron said "it is up to the United Kingdom to present a credible alternative plan, backed by a majority, between now and April 10." The meeting between Macron and Varadkar was billed as an opportunity for them to exchange views on Brexit, and the French leader said: "We will never abandon Ireland and the Irish, whatever happens, because that solidarity is the very meaning of the European project." But differences are emerging between the two sides as the possibility of a "no deal" Brexit looms, which would lead to the creation of a border between the UK territory of Northern Ireland and Ireland. "We need to talk about what we will do in the event of 'no deal', which will be particularly difficult for Ireland," Varadkar admitted. In the event of a "no deal" Brexit, the Irish border would become the only land frontier between non-EU Britain and the rest of the bloc and would therefore in theory need to have customs controls. A spokeswoman from the French government said on Monday that France wanted to avoid "Brexit causing Ireland to be detached from the European Union." The EU's Brexit negotiator, Michel Barnier, said Tuesday the EU was working with Ireland "on a unilateral basis in the event of a no-deal deal, to know where we can do these checks" but refused to elaborate further. "We are working very closely with Irish authorities to try and perform controls away from the border if at all possible," an EU official, who did not wish to be named,” said last week.